This project included multiple improvements to the 600,000 sq. ft. Scottrade Center. A water condenser was replaced to allow for a more efficient way to operate the HVAC system and the ice plant. The production control room underwent two phases of renovation to create a more organized workspace with improved functionality. Upgrades were made to 18 suites including new paint and flooring. 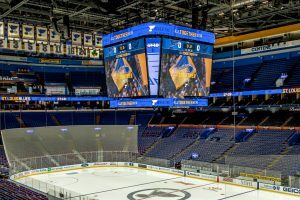 Renovations were also made to the Bud Light Zone, Blue Note Lounge, and several concessions areas upgrading kitchen equipment, signage, and seating. The True Blues gift shop was renovated to improve the overall look and design and create a better traffic flow during Blues games.